Allens Sherbies are an old time favourite with the unique tangy taste. A chewy orange lolly and inside filled with sherbet. A great choice to add some zing to your lolly jar, they have individual wrapping. Purchase on its own or this product is also included in our Allens Wrap Mix. They are also on the Nestle gluten free list. 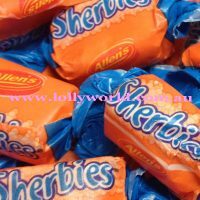 Allens Sherbies are an old time favourite with the unique tangy taste. A chewy orange lolly and inside filled with sherbet. A great choice to add some zing to your lolly jar, they have individual wrapping. Purchase on its own or this product is also included in our Allens Wrap Mix.